Home » Hoops » D-Wade or James Harden? 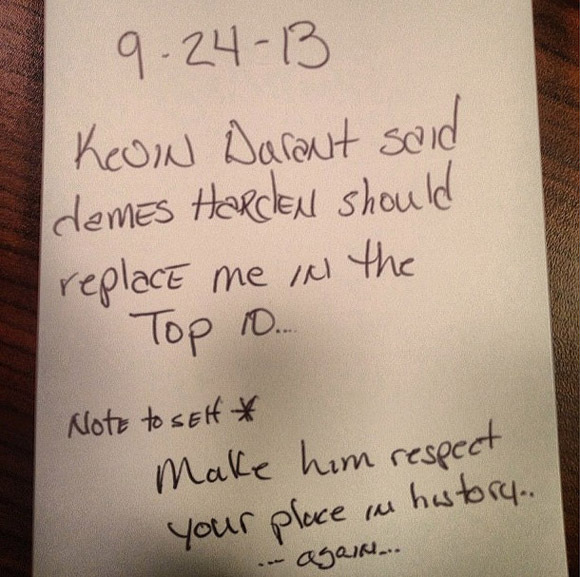 So apparently Kevin Durant thinks that his former teammate James Harden is a top ten player in the NBA. That’s cool but the player Durant thinks Harden should replace, is three time NBA Champion Dwyane Wade. Now that Wade and Durant have gone back and forth about it on twitter (aka the best place to let your feelings out), let’s think about the statement. Is James Harden better than Dwyane Wade right now? Of course anybody that’s watched the NBA since the 2003 draft class took over, the response would be definitely be that Dwyane Wade is the better player. I mean, its simple Wade has won three championships and been invited to countless all-star games and all-NBA teams. For most of his time in the NBA D-Wade has dominated and been a top two shooting guard alongside Kobe Bryant. Last season something changed, James Harden happened. When the Oklahoma City Thunder traded James Harden to the Houston Rockets, to put it simple Harden went off. James Harden was pretty lethal last season, and even lead his team to the playoffs. His numbers were something like 26 points, 5 rebounds and 5 assist. Of course his team was nothing like the Miami Heat who won the championship, but still Harden showed that he’s a legit superstar. Now I think there is nothing wrong with Kevin Durant’s statement. I know a lot of people took offense to the statement because Wade is considered such a great player but lets be real here, Wade played pretty bad last year. I know a lot of people try to tip toe around the fact that D-Wade disappointed but I’m not. He was hard to watch most of the playoffs, and only showed up as LeBron’s “Robin” a few games. I remember watching most of the playoffs and feeling bad for LeBron because literally everyone else played completely garbage. There’s always that excuse that Wade was injured but nobody else gets that treatment so he’s not getting it from me either. Harden actually went toe to toe with the Westbrook less Thunder and almost could have won that series. Now if we go by playoff wins and experience, Wade wins hands down. Now if we go by who did more for their team last season and had the bigger impact, we have to go with Harden. I think the bigger question is James Harden now the best shooting guard in the league? Just from the reactions of Wade fans I know that would make Kobe Bryant fans go crazy, so I’ll leave that question alone for now. Now if Wade is healthy then we might have a new argument here but for now I’m rolling with Harden and Durant. Durant tweeted Wade to show him so now I want to see, and I definitely cant wait to see the Heat and Thunder face off. Do you agree with K. Durant?